Room was very big with a banging view of the strip. Bathroom was big big as well. Got a bang out of every single buck I spent for my stay. Staff were pleasant and check in was quick and the young lady who assisted was very sweet. Definitely coming back with my kids next trip (I loved the fact that I didn’t have to walk thru the casino to get to the rooms). Key access elevators to the rooms. Can’t wait to come back. Great hotel for the family. I enjoyed everything. The staff. The bedding. The view. The pool had a nice, family atmosphere (except for old guy in Speedo.) the only issue I had was the auto tip on room service so I double tipped unaware. $50 fries, nachos, cranberry. Pillows were extremely hard, found hair in the bath tub and no coffee in the room. it’s just a very Average hotel and casino. Hard to find the hotel - no specific hotel parking. Although rooms were very nice/clean etc everything else was extra. Resort fees extremely high for what you get (a small gym and main pool closed over winter - other pools only open 10-4). Not worth the extra. Too far from strip. Often, upon leaving our room we would be greeted by rubbish bags/dirty laundry bags/room service food leftovers. Staff were all pleasant enough. Woken up at around 6am one morning from construction next door. Wouldn’t reccomend, although lovely rooms, extremely overpriced for what’s on offer. One day I requested maid service three time from about 9a.m. until 3p.m. before they responded. The next day even though I had the "do not disturb" sign on the maid service knocked on my door 4 times. I ordered room service one day and the order was wrong. The food I did receive was bad. The drain in the bathroom was backed up and maintenance said he would have to snake the drain which would result in a terrible smell. I refused to have this done but he was still in and out of the room multiple times while I attempted to rest. The mini bar charges were inaccurate. A beautiful hotel if you want to be in Summerlin. If you want to spend quality time in the great outdoors (5 minutes from Red Rock Canyon), then this is the place! With all its amenities, service, and great dining, the Red Rock Resort is also a very suitable hotel to take your kids to. Prices for dining out are almost half of what they are on the Strip! And if you want to gamble, you can't beat the $5.00 blackjack minimum. 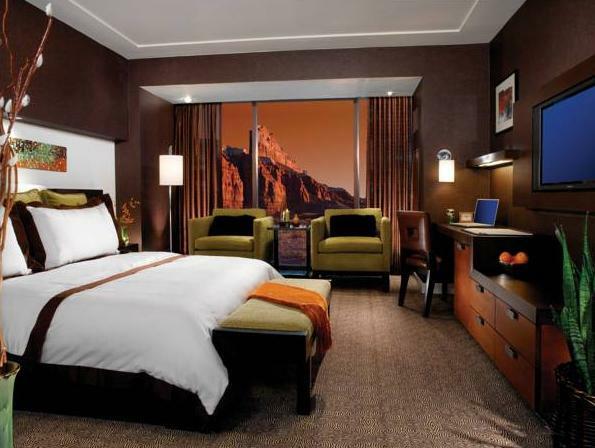 ($15-25 minimum in the Premium Strip Hotels). We especially enjoyed "the Yard House" for its excellent appetizers and entrees and choice of 120 brews on tap! Staff friendliness, room size and comfort and the endless options for places to eat,drink and play! Everything in the hotel was wonderful. The only downside we found was the location as it is a distance from the strip. The courtesy shuttles last trip to the strip is at 9:10 at night and doesn't have one back after so a cab is required after that. The food and bars are amazing while all areas of the hotel are wonderfully designed. 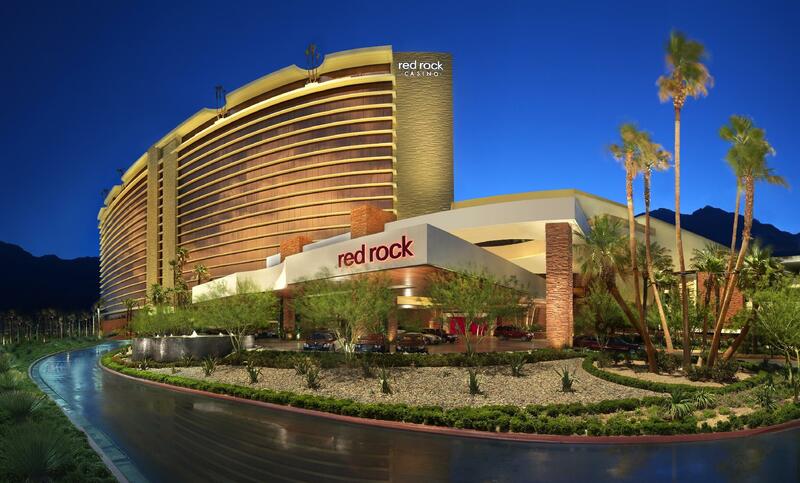 Red Rock is an excellent place to go for relaxation. The atmosphere is casual and the food and activities are numerous. It is a good change of pace from the intensity of the Las Vegas strip. There are enough amenities to keep you busy or relaxed; whatever you heart desires. The fitness center is also very clean and offeres a reasonable amount of equipment. Interior design of the hotel and the rooms are beautiful. Very chic pool area. Wonderful service staff. This is a very nice hotel with a modern interior design. The valet staff was very friendly and helpful. The rooms are well appointed except all the room elevators were located at one end of the building so you may have a long walk to your room. red rock's was a great place to stay. in fact we wished we had stayed longer than one night. the guest room we stayed in, (i believe it was cheapest room) was awesome! it was an enormous room and the bathroom was great. it had a large soaking tub with tv and a separate shower. we would definitely stay there again. also, it was easy to get to since it was not on the strip. Main hotel part of the resort felt luxurious, friendly staff over all. Room very impressive although housekeeping was a let down at times. Very spacious room. Lots of eating choices from cheap to higher end. Casino relaxed and non invasive if not wanting to gamble. Pool area stunning and staff very good and friendly. Loungers super comfy, great for relaxing. Good value cinema and bowling on site - fun activities away from the strip! They have great restaurants, casino, pool. The room has a perfect size. Our kids stayed at the Kids Quest and they were amazing with them. They have great restaurants, casino, pool. The room has a perfect size. We toke our 16 months old girl and a 6 year old boy with and they stayed at the Kids Quest for a couple of hours and the girls were amazing with them. They loved it. The Hotel was lovely by appearance and is good if you want to be far away from the strip in a resort style hotel, but a few issues made our stay quite unpleasent. The receptions were very rude to us when checking in, they complained about a dance competition we were involved in that was being held there, syaing they wouldn't be behind if it wasn't for our stupid dance event. The rooms are very nice BUT the fridge that comes with the room is locked and does not open unless you purchase something from the mini bar which you must notify someone before hand. Because of this is was not possible to have cool refreshments available in your room. Also water was not bought in daily, you needed to go up to reception which is unappropriate for the weather conditions in Las Vegas. Room service was very good, although french fries tasted as though they had been sitting there for a while. And lastly if you to have easy access to the strip when you want, this hotel is not appropraite unles your prepared to pay $45-$60 for a taxi one way every time, but if you want to be away from it then by all means this is the place for you. I wouldn't reccommend people between 20-30 staying there, as there isn't much to do, but it would be nice for a family. It was a great venue for the dance competition, but the experience would have been so much better is the staff were more supportive. This is an absolutely beautiful hotel, situated within a bustling "Vegas"casino, but not smack in the middle of the noise and excitement. The rooms are located in a separate, quiet area, so one can get a break from the action for a wonderful night's relaxation and sleep. The beds are heavenly; the decorating exquisite......and THE POOL area, :::Perfect! We ate in four of the restaurants. "T-Bone Steakhouse" being our favorite. The food was very good. They also have a nice outside bar, which was fun. The Italian place had excellent food, but the wine list was way too fussy, with virtually nothing for a middle-of-the road diner, all the wines were quite high priced. We ended up drinking cocktails with our meal instead. On the casual end, the grill in the sports book was great, YUMMY burgers, at a great price!!! Our experience in the "Salt Lick BBQ" was not so great. It was sort of Appleby's does BBQ .... not horrid, but lots of room for improvement! But the true reason we booked here was the location. The Red Rock Conservation Area is very close, and the natural beauty there is stellar. We will definitely return to this resort the next time we come to the Las Vegas Area. Long walks to eleavators from most rooms, only one eleavotor to lobby. The Hotel is a beautifully moderned design. Lobby lovely to sit and relax. Casion clean and fresh smelling unlike some of the older Hotels. Everyone was very friendly and helpful. Nice poolside accomadations with eleavator from rooms right to pool. The Buffett was a great value and had everything you could ask for.